Romania: Real Madrid in Craiova next year? Already in November 2016 the new Ion Oblemenco Stadium in Craiova should be ready for opening. So far we know it will retain the current name, though a sponsored phrase is also considered. A major European team is expected to arrive for opening of the stadium. Mayor Olguta Vasilescu is dreaming big, of Real Madrid. But she admits everyone need to be patient. “The club entered negotiations with several foreign teams and we have to wait for their announcement”, Vasilescu said. The new stadium will cost €55 million ($60m) and hold over 30,000 people. Currently the construction is delayed, but should still be ready for opening in 2016. Ground floor is being built in the west, while remaining sides are at foundation level. 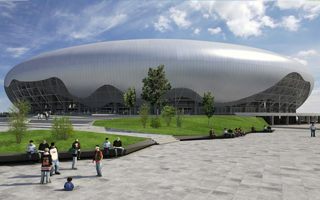 The stadium, designed by renowned Romanian office Dico si Tiganas, is inspired by the art of Constantin Brâncuși.